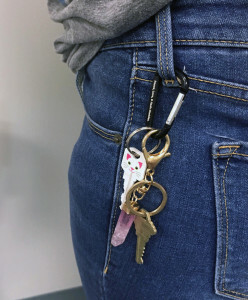 Say Hello to our Smallest and Cutest Carabiner! With the 50 mm coming in around 2 inches long - its the best carabiner to use for promoting your business, school or event that is coming up! With one or two sided engraving you can promote the new item you’re selling, a school championship or even just the pride in your upcoming wedding and having an adorable gift to give to your friends! 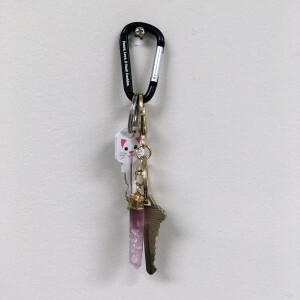 Those are just naming a few interesting ways to use our 50 mm carabiners, but there are many other ways to employ this cuties. Don’t just limit yourself to what I’m thinking about! We know that you’ve got an idea and a purpose to your ordering - and we’d love to hear it. Just follow the steps on the side of the webpage beside our carabiner and you’ll be taking the quick steps to ordering your custom product! Now all of our carabiners come in multiple colors: Royal Blue, Caribbean Blue, Red, Gold, Green, Orange, Purple, Black or Silver. Which means we’ve got you covered when it comes to school pride, keeping designs close to your original business colors or just when it comes to picking out your favorite color. 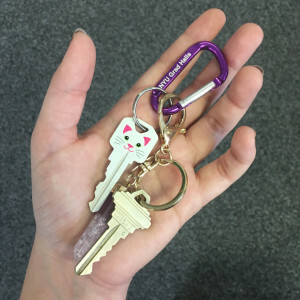 You can order the carabiner alone or with split keyring for your convenience (additional chargers apply). Our custom laser engraving is amazing, because of our skilled engravers, that when it comes to our carabiners, not only will it help protect your desired text from damages because of the placement - we make sure that every engraving is as perfect as possible. Our engraving texts will always come out close to a silvery/white color - which unfortunately means we won’t be doing color text on a carabiner - but we make up with it by having multiple color carabiners to choose from (see above colors!). With the engraving color a silvery/white it brings out your text and makes sure it’s the star or the show - so don’t worry that it won’t look good because, trust me, it will look amazing! The process of ordering is quite simple! You can use our totally user friendly option on the website, just make sure you’re on the desired carabiner you want (of course, try out the 50 mm since we’re talking about it!) and start by picking the amount you would like to order, the color you like the best, then it’s on to the choice of front engraving OR front and back engravings! You can also add the text in the box below of what you would like engraved, or attach an art file (pretty cool, huh?). Lastly just let us know if you would like to add split keyring to your order and hit send! 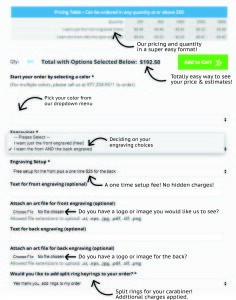 See below for a little chart that gives a few details about our ordering system! We may talk about “cheap carabiners”, but the only cheap part of our product is the pricing. We take pride in the trust from our customers - our promise is to alway make sure you have the best experience with us. Nothing leaves the facility without us checking it to make sure it’s 100% up to standards. In the end, if you’re unsure of the exact order you would want or your order may be a little more complicated… that’s a-okay! Because you can also call us at 877-204-9511 or email us at service@wholesale-carabiners.com. We’re super nice so don’t worry or be nervous about getting ahold of us! We love hearing from our customers. This entry was posted in Product and Design and tagged 50 mm carabiner, 50 mm, how to, engraved carabiners, engrave, engraved, engravings, carabiners, keychain, promotional products, wholesale carabiner, carabiner on September 8, 2016 by Wholesale Carabiners. Joie Gahum on Carabiner Shapes For Summer Fun!